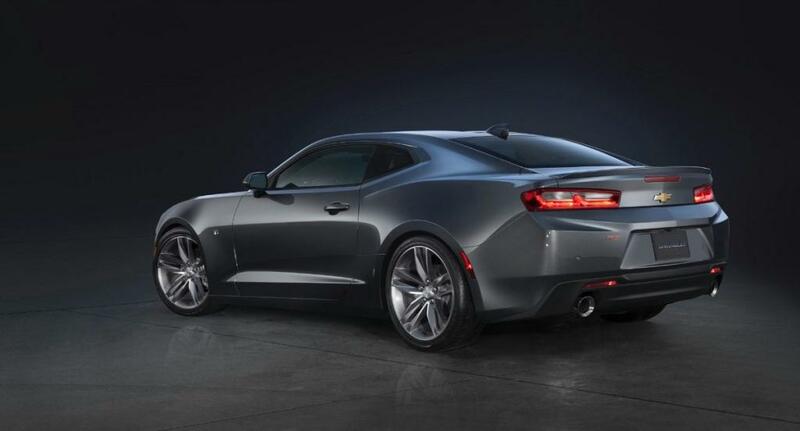 Chevrolet has introduced the redesigned 2016 Camaro, a smaller, lighter, and more technologically advanced version of its iconic sports coupe. Initially offered in LT and SS trim levels, the new Camaro will be available with a choice between three different engines, two transmissions, and a number of ways to customize the car to personal preferences. During the 2016 Camaro's debut in Detroit, Mark Reuss, executive vice president of product development for General Motors, said: "For Camaro enthusiasts, it retains iconic design cues and offers even more performance. For a new generation of buyers, the 2016 Camaro incorporates our most innovative engineering ideas with finely honed performance and leading design." While the overall design may look familiar, Chevrolet says the 2016 Camaro is all new, right down to its redesigned red, white, and blue emblem. Just two parts carry over from the old car: the rear Chevy bowtie badge and the SS emblems applied to the performance-oriented version of the car. Dimensionally, the Camaro shrinks in every direction, yet the car remains larger than a Cadillac ATS Coupe. Engineers shaved more than 200 lbs. with the new design, and structural rigidity improves by 28%, according to the automaker. Chevrolet retains iconic Camaro styling cues while at the same time improving aerodynamics. The Camaro LT is claimed to slip through the atmosphere with less drag, engine cooling is improved for both versions, and the new design adds aerodynamic downforce for the Camaro SS. As the version designed for high-performance driving, the 2016 Camaro SS also has integrated brake cooling ducts, functional hood vents, unique rear spoiler, and standard 20-in. aluminum wheels. The SS model's HID headlights, LED running lights, and LED taillights are available for the Camaro LT by ordering the RS package. Chevrolet also says that the new Camaro is easier to customize through 10 different paint colors, five different interior color and trim combinations, and a number of dealer-installed accessories that will be available from the moment the car goes on sale. In an effort to resolve a common complaint about the outgoing fifth-generation Camaro, Chevrolet says the sixth-generation model's interior is equipped with improved materials. Interior Spectrum Lighting is optional, an LED ambient lighting system providing 24 different effects for the car's dashboard, door panels, and center console . Drivers face a new flat-bottom steering wheel fronting analog gauges residing beneath a familiar dual-binnacle hood. An optional, 8-in., color-configurable display screen is installed between them, providing quick reference to a number of vehicle features. A next-generation version of Chevrolet's MyLink infotainment system sits in the middle of the dashboard, equipped with an 8-in. display. New air vent designs reside beneath the MyLink screen, including new surrounding control rings that eliminate the need for traditional knobs and buttons. Below the air vents, the center console is designed to be "shifter-focused," according to Chevrolet. Three different engines are available for the new Camaro. The LT is equipped with a standard turbocharged, 2.0-liter 4-cylinder engine, 6-speed manual gearbox, and rear-wheel drive. A paddle-shifted 8-speed automatic transmission is optional, and Chevrolet estimates the Camaro LT will accelerate to 60 mph in "well under" 6 seconds while returning better than 30 mpg on the highway. The engine is rated to make 275 horsepower and 295 lb.-ft. of torque. Chevrolet says that at least 90% of peak torque is available from 2,100 rpm to 3,000 rpm, while maximum torque is generated between 3,000 rpm and 4,500 rpm. Active noise-cancellation technology is included with this turbocharged 4-cylinder engine, and cars equipped with the optional premium audio system include a driver-activated active engine-noise enhancement feature. 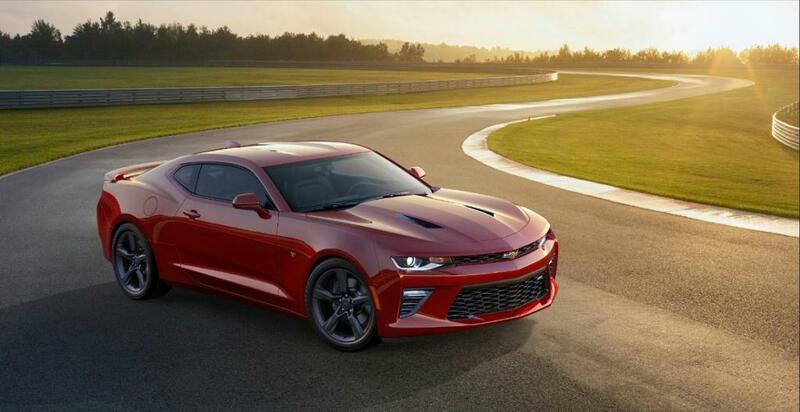 As an option for the Camaro LT, a new 3.6-liter V-6 engine makes 335 horsepower and 284 lb.-ft. of torque. This engine features direct fuel injection, continuously variable valve timing, and Active Fuel Management technology that can, under certain driving conditions, shut two cylinders off to improve fuel economy. A mechanical sound-enhancement system is standard with the V-6. The 2016 Camaro SS is equipped with a direct-injection, 6.2-liter V-8 motor making 455 horsepower and 455 lb.-ft. of torque. A modified version of the engine used in the Corvette Stingray, the motor carries an "LT1" designation, making it only the third small-block Camaro V-8 in history to receive that honor. Active Fuel Management and a mechanical sound-enhancement system are standard with the Camaro's LT1 V-8, and the manual gearbox includes Active Rev Match technology. All 2016 Camaros include a Driver Mode Selector with Snow/Ice, Normal, Tour, and Sport driving modes. The Camaro SS adds a Track mode. A dual-mode exhaust system is optional for the LT and SS, and drivers can calibrate its note to Stealth, Tour, Sport, and Track set tings. The redesigned 2016 Camaro rides on a new multi-link MacPherson strut front and 5-link rear suspension design. The Camaro LT is equipped with standard 18-in. aluminum wheels, and can be optioned with 20-in. wheels wrapped in all-season, run-flat performance tires. The Camaro SS includes 20-in. wheels and run-flat summer performance tires. Quick-ratio, variable-effort electric steering is standard for all versions of the new Camaro. Upgraded Brembo braking components are optional for the Camaro LT and standard for the Camaro SS, and a Magnetic Ride Control active suspension setup is optional for the SS. According to Chevrolet, the 2016 Camaro SS model's performance and handling improvements make it faster around a track than the previous Camaro SS 1LE. About the redesigned 2016 Camaro's performance, Aaron Link, lead development engineer said: "The driving experience is significantly different. Immediately, you will notice how much lighter and more nimble the Camaro feels. That feeling increases when you drive the Camaro harder--it brakes more powerfully, dives into corners quicker, and accelerates faster than ever."